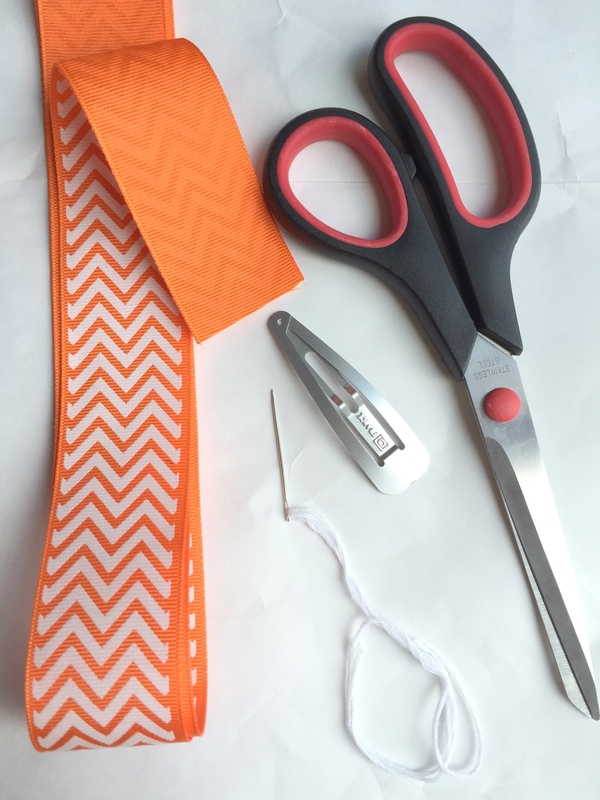 You will need: about 2 feet of ribbon per bow, a needle and thread, a hair clip, sharp scissors, and a glue gun and glue (not pictured because my glue gun is not attractive). 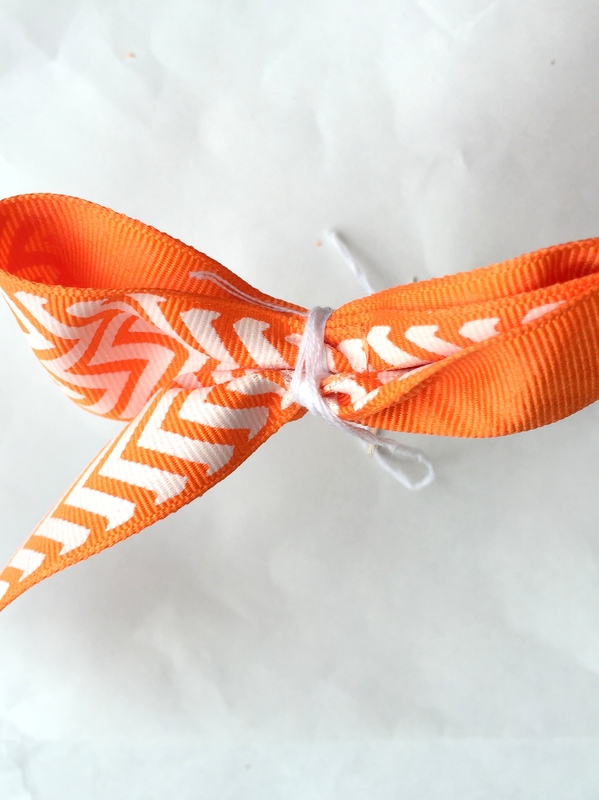 Create the bow by folding the ribbon over itself, making 2 loops with the ribbon and sizing the bow to your liking. Then, stick your threaded needle through the center. 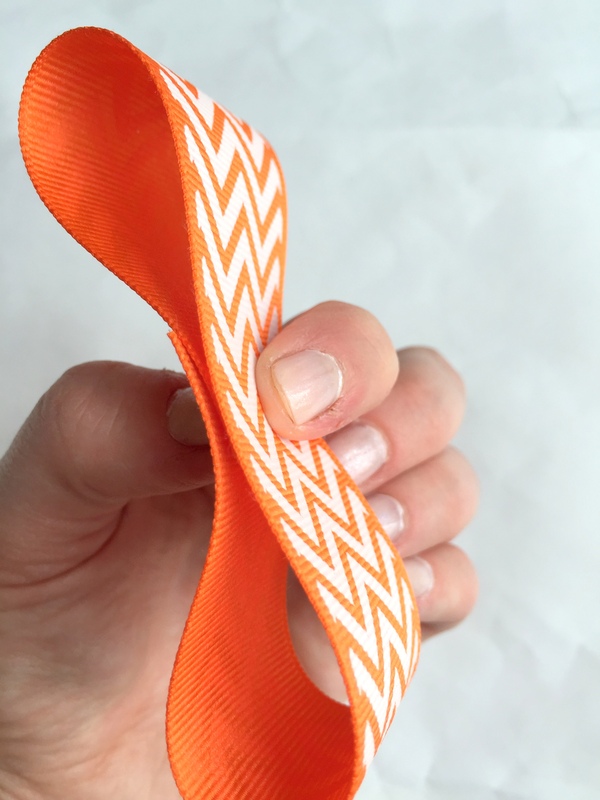 Fold the ribbon in the center like an accordion to get the right look and wrap the thread around and tie in back to hold in place. 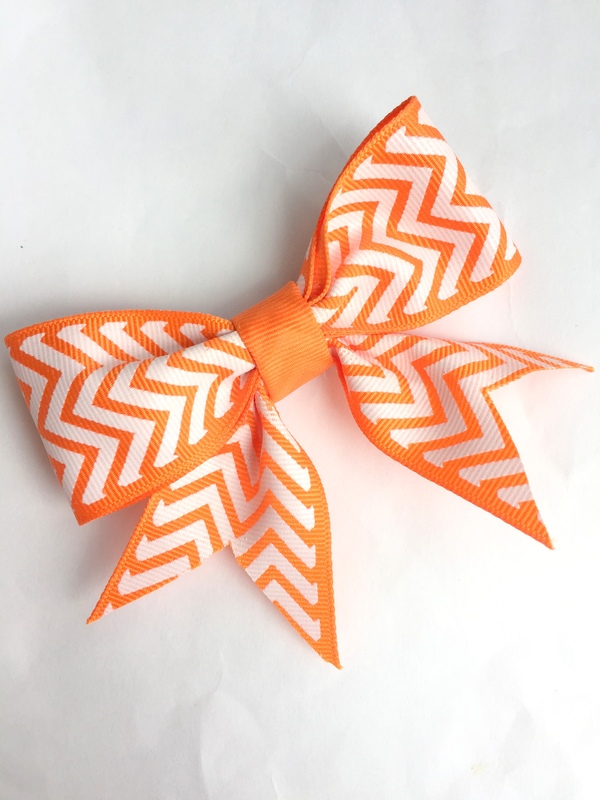 Next, make the tail piece of the bow. Cut the ends for the tail look and again stick your threaded needle through the center and wrap around the ribbon. 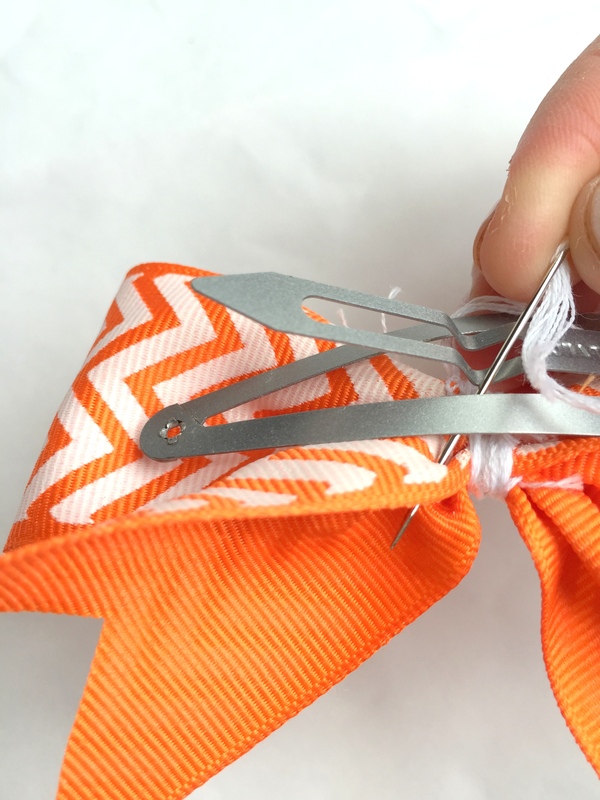 Use the thread to tie the tail ribbon to the bow ribbon. 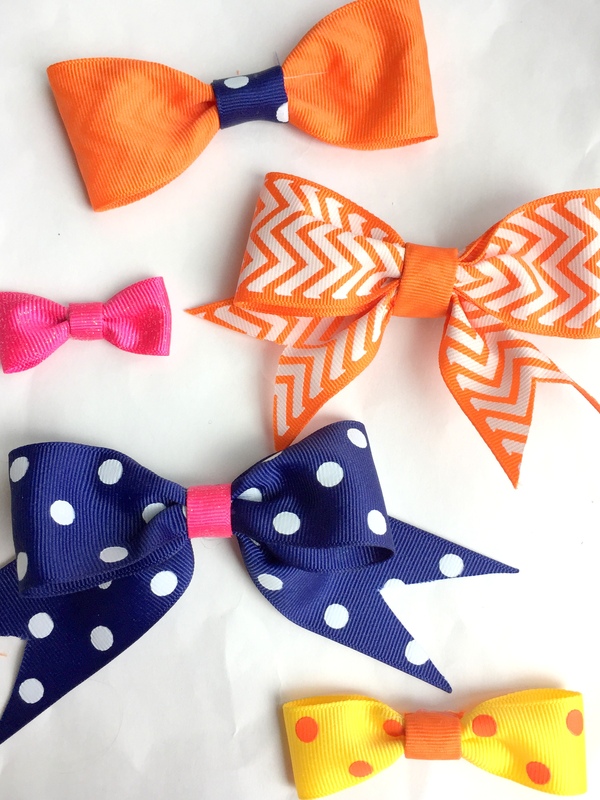 Next, sew your hair clip to the back of the bow. I used these snap hair clips because my daughter has thick hair and these stay in well. And finally, to finish the project you want to wrap ribbon around the center of the bow. 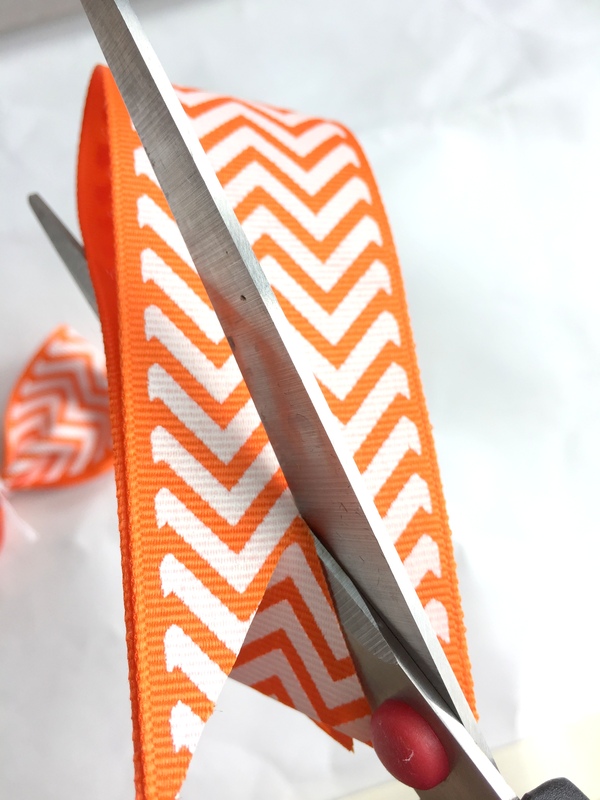 Take coordinating ribbon (I used the plain orange reverse side of the chevron orange ribbon) and fold into thirds (or fold in half, depending on the width of the ribbon). 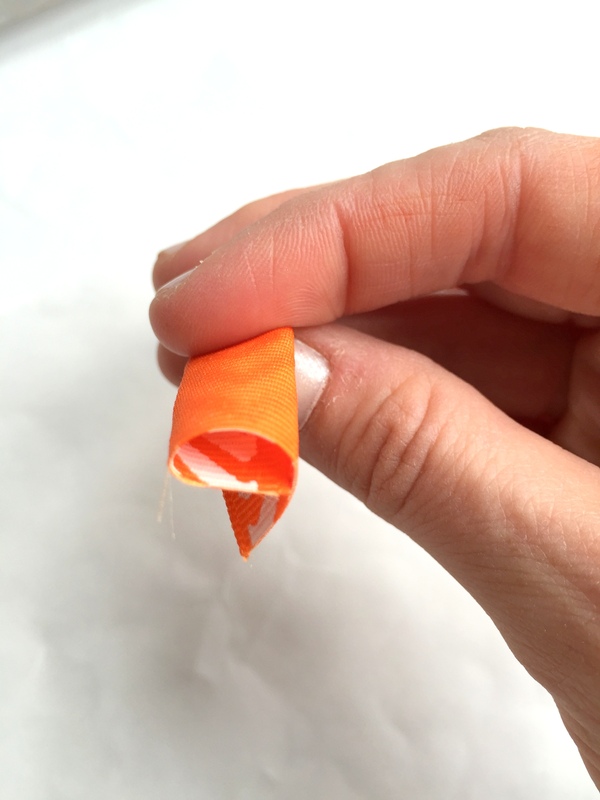 Use your glue gun to secure in the back. 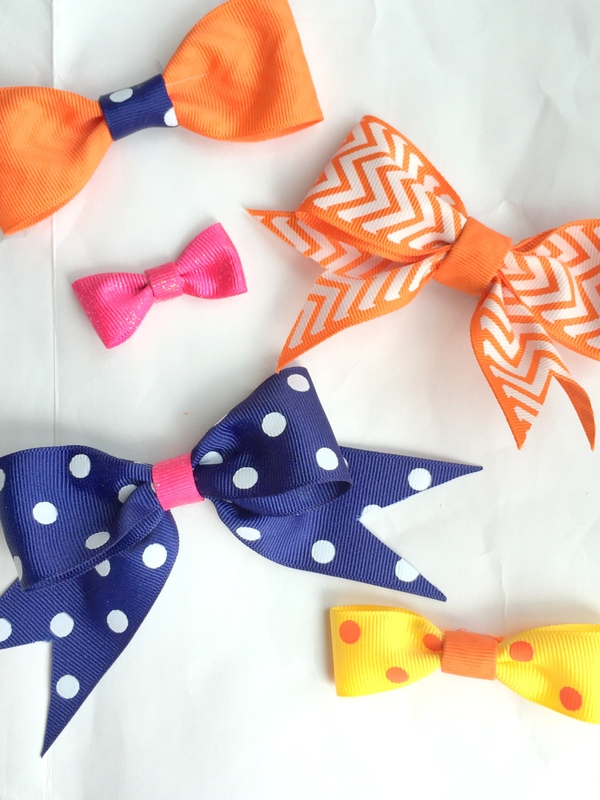 Once you know the steps to make your own ribbon hair bow you can make them in all shapes, sizes, colors, and patterns. 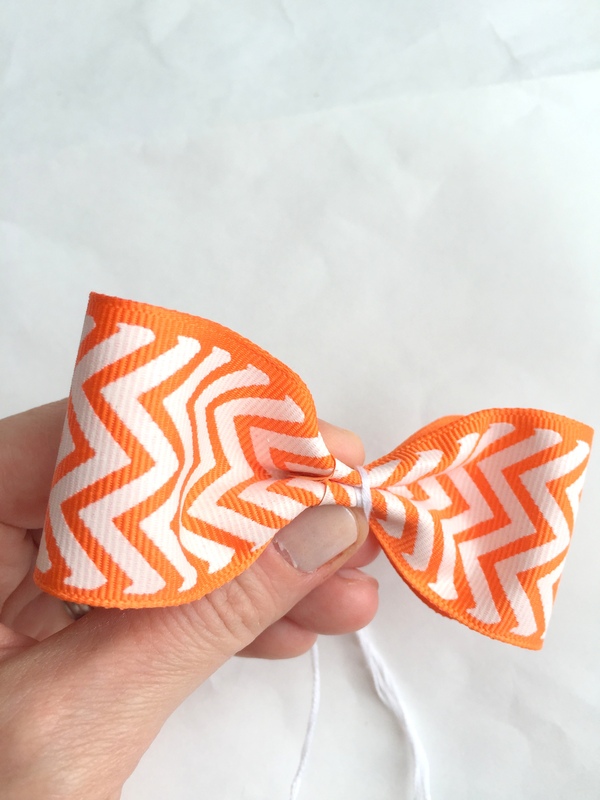 And leave off the tails for a tinier/simpler bow, too. 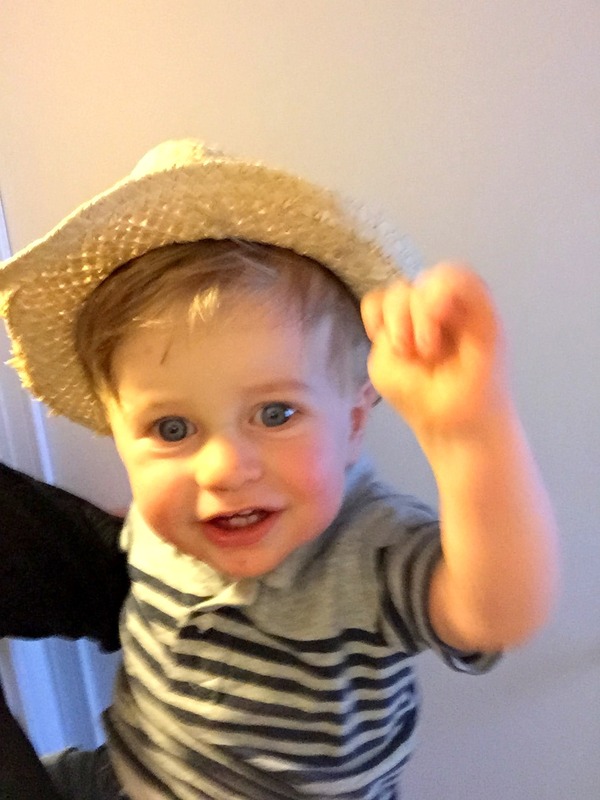 Thank you to Offray for sponsoring this post! And thank you for supporting the brands that support Styled by Jess. Chasing Daddy and big sis, he crawled his little heart out but could not catch up! 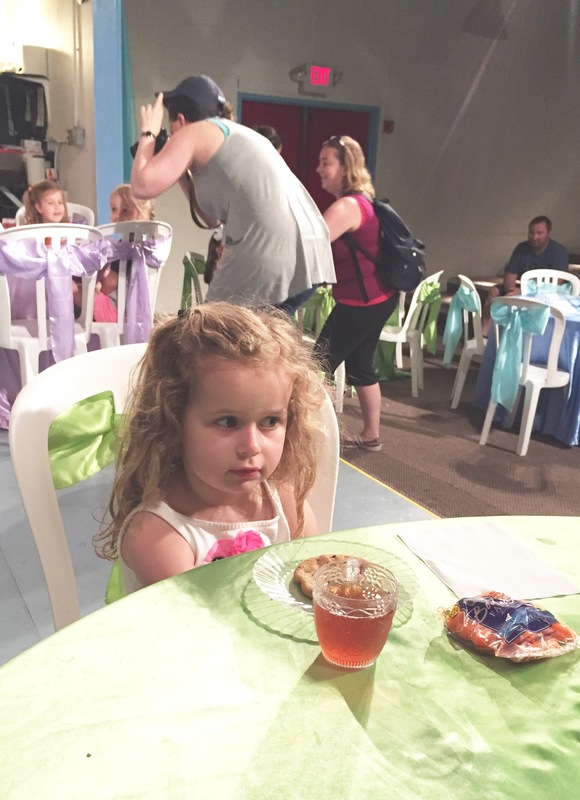 We went to Story Land in NH this past week and having tea with Cinderella was her absolute highlight. Here she is very nervous waiting for Cinderella to arrive. 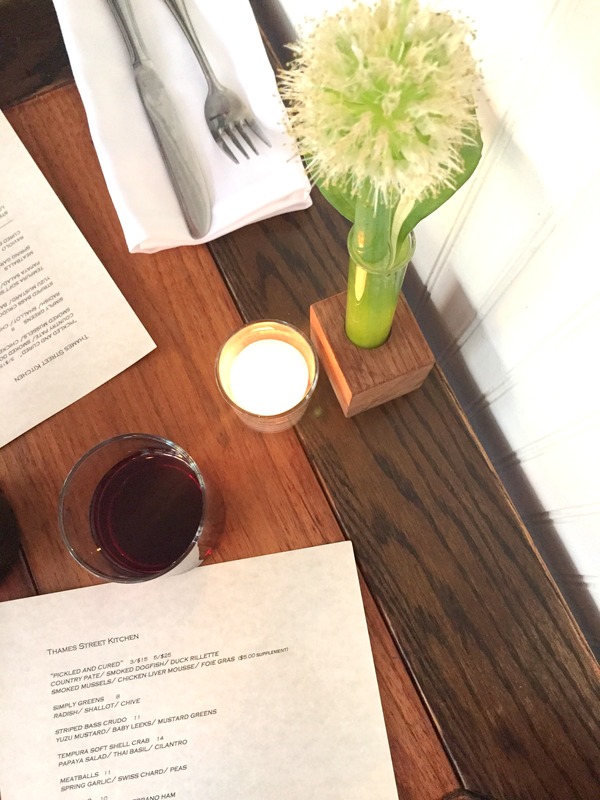 We ate at tsk (that’s Thames Street Kitchen) and it did not disappoint. The space is very cozy (and no AC so be prepared to sweat in the summer!) 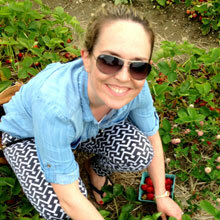 and a menu that changes weekly depending on the local ingredients available. Oh, and it’s BYOB so bring your fave bottle of wine or stop in at the liquor store down the street if you forget. 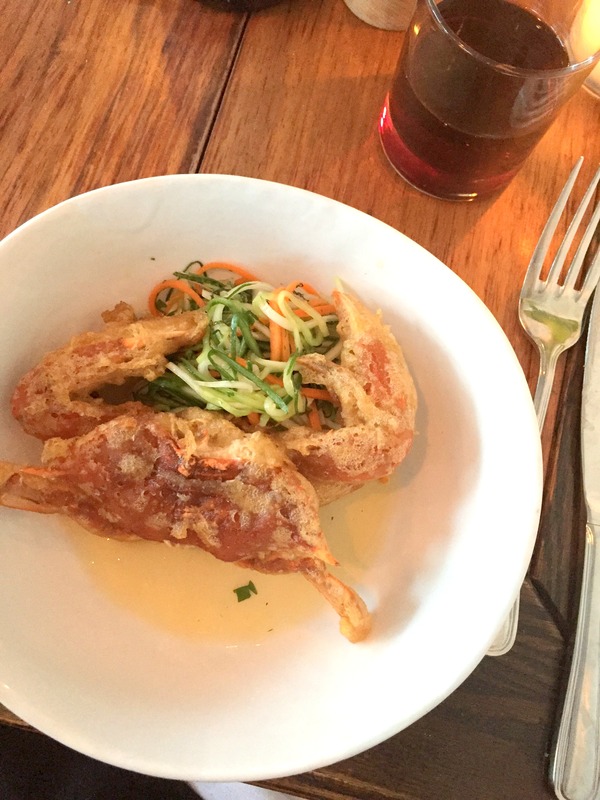 The food was incredible – above is my appetizer: tempura soft shell crab, so delicious. They had 5 entree options and almost always have a version of their fried chicken and always a beef option. For dessert they only had cookies, donuts, or ice cream which felt very simple to us but after such a gourmet meal a tiny donut was just what we needed. 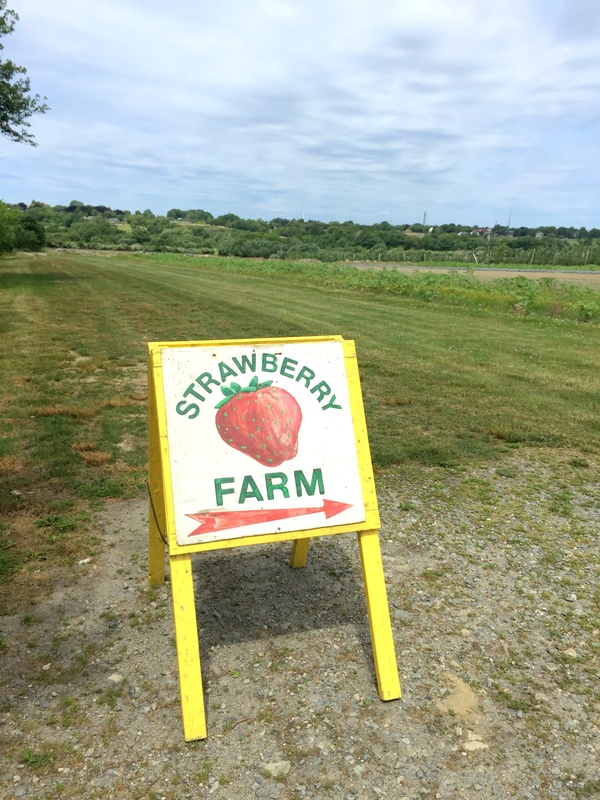 The next day was perfect strawberry picking weather so to the farm we went! 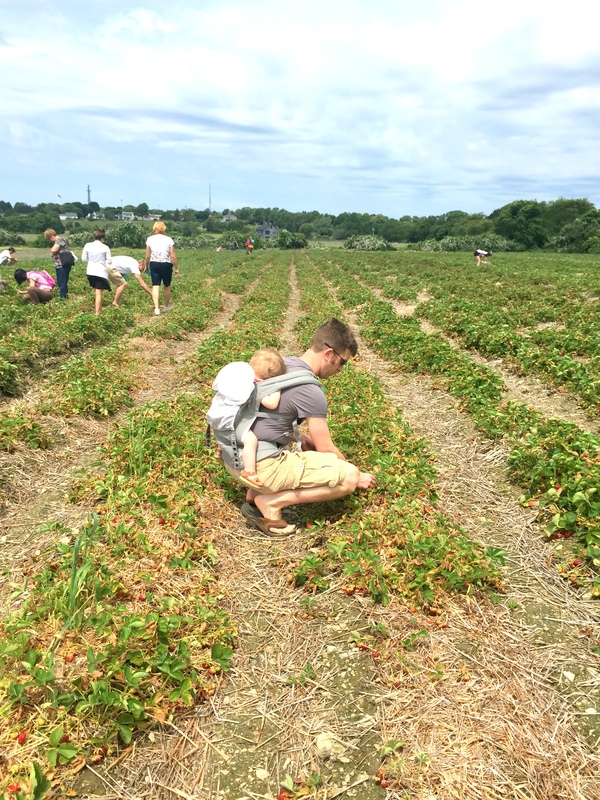 We love Sweet Berry Farm in Middltown, RI for all our berry picking – (strawberries, peaches, blueberries and raspberries, and even before kids!). …and ate only a few. It sure was exhausting (for them too, ha!). 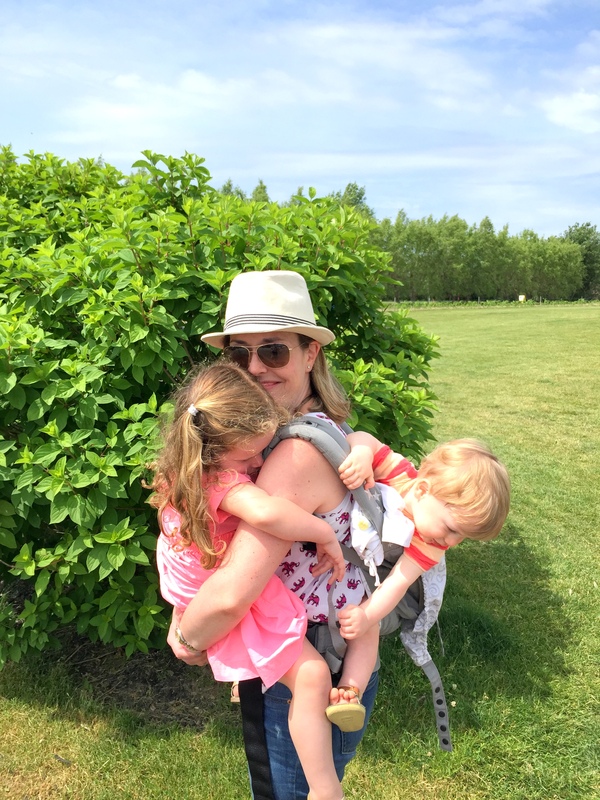 The next day was father’s day and we celebrated with my husband, dad, and brother in law. 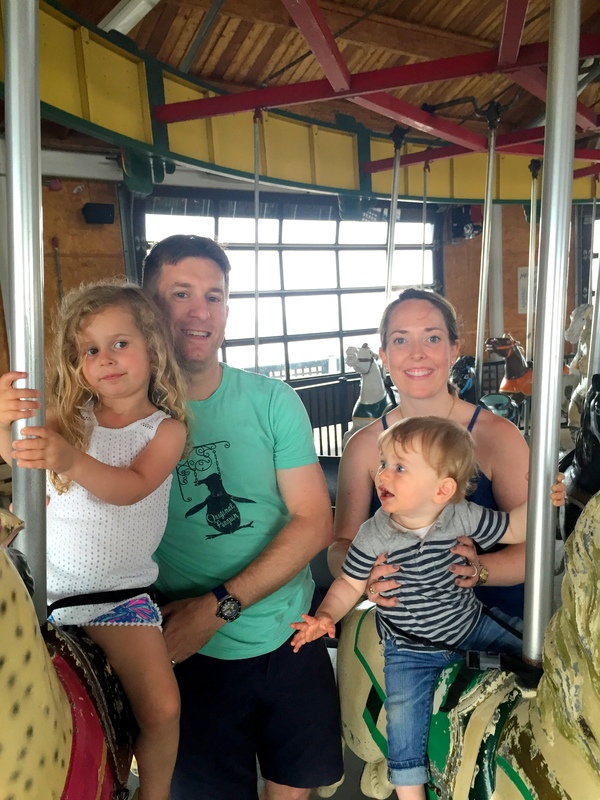 On our way out of town we hit up the venue where we got married where there’s an old fashioned carousel. We love, love where we got married especially because we can visit every year with the kids and go down memory lane of our fabulous wedding day. We were the only ones on the carousel and they blasted the music and it was such a fun moment remembering that night! Great weekend! Our CSA started up again at the beginning of the month and we’ve been loving all the super fresh veggies in our lives again. With the freshness (and therefore delicious-ness) of such fresh veggies we don’t like to do too much to them in terms of cooking and let the veggies shine through! 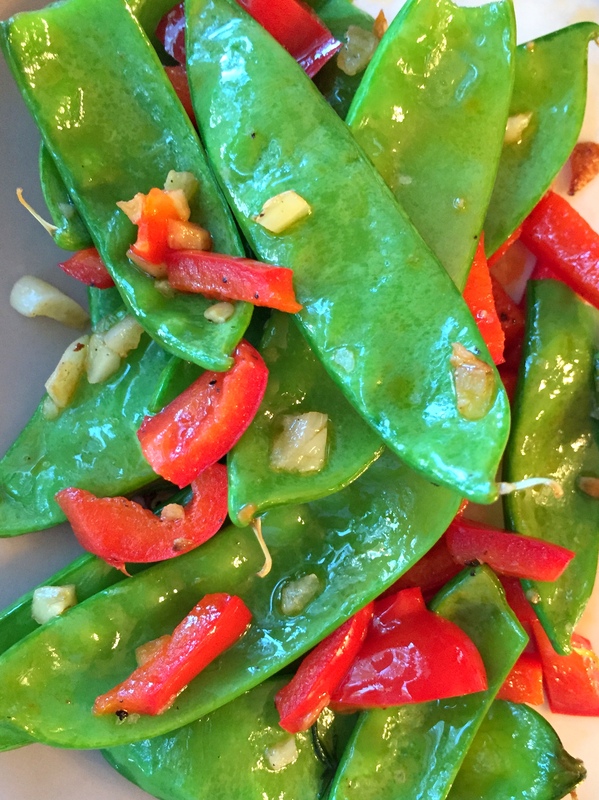 Last week we got a little pint of snow peas and we knew just what to do with them. 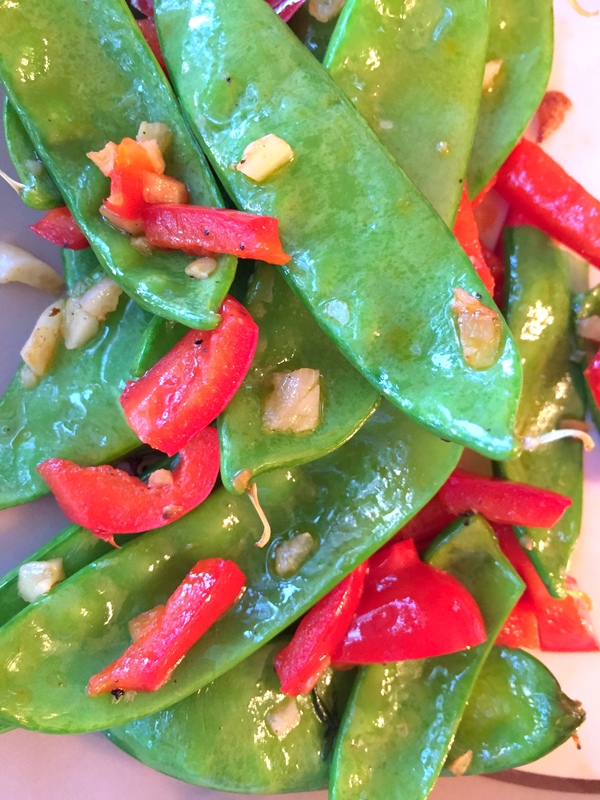 These 7 minute snow peas obviously cook quickly and are just so easy to make, too. Dice about 1/4 of a red pepper and chop 1 or 2 cloves of garlic depending on your taste. Heat about 1 teaspoon or 2 of oil in a skillet over medium high heat and add garlic when oil has heated up. 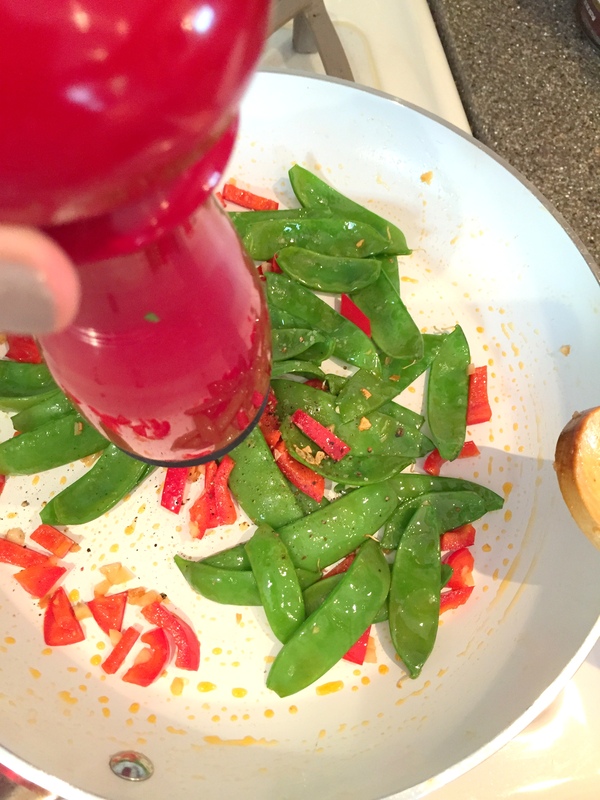 Once you smell the garlic add the snow peas and red pepper in and cook for about 5 minutes. Season with salt and pepper. Serve warm. 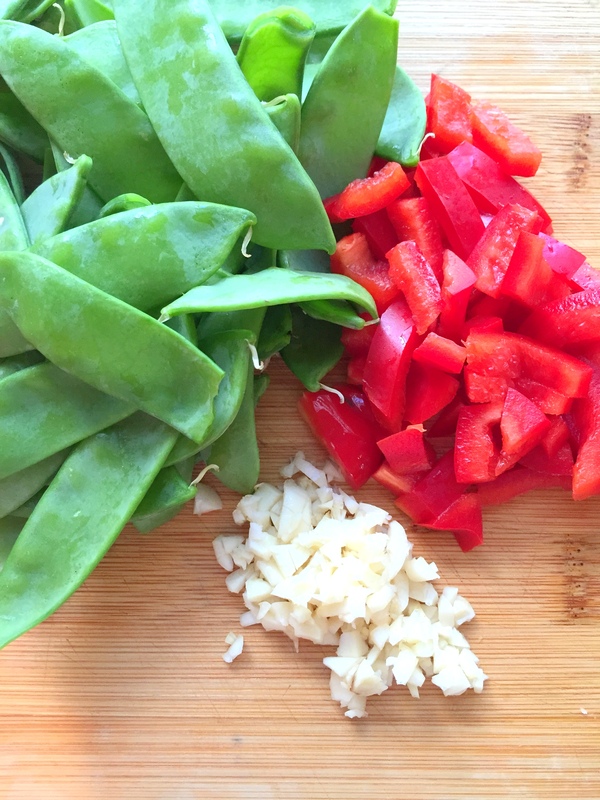 Your snow peas will be slightly crunchy and oh so flavorful – enjoy! 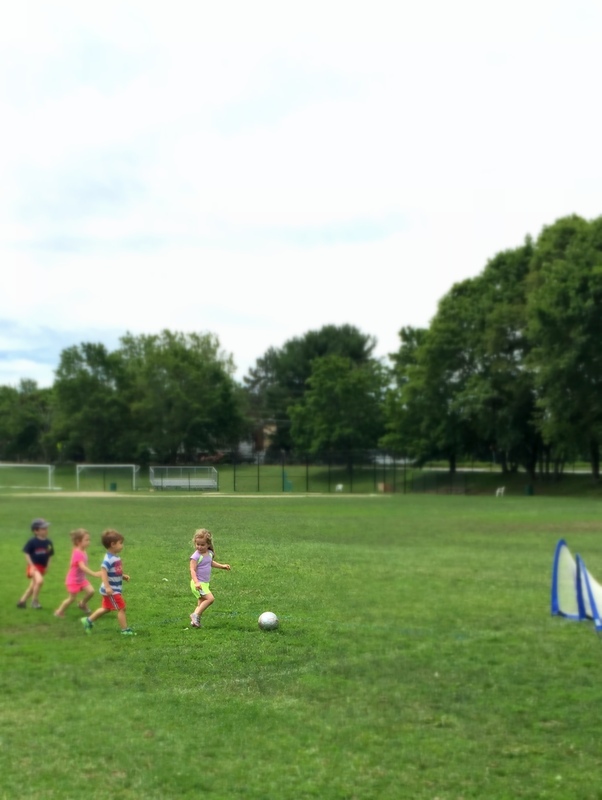 Her last week of soccer this season and she had a great break away during the scrimmage! With hotter temps comes the desire to eat lighter food, right? And with that we are always searching for easy, delicious salads to eat for dinner that don’t involve pasta (even though I do love a good pasta salad). 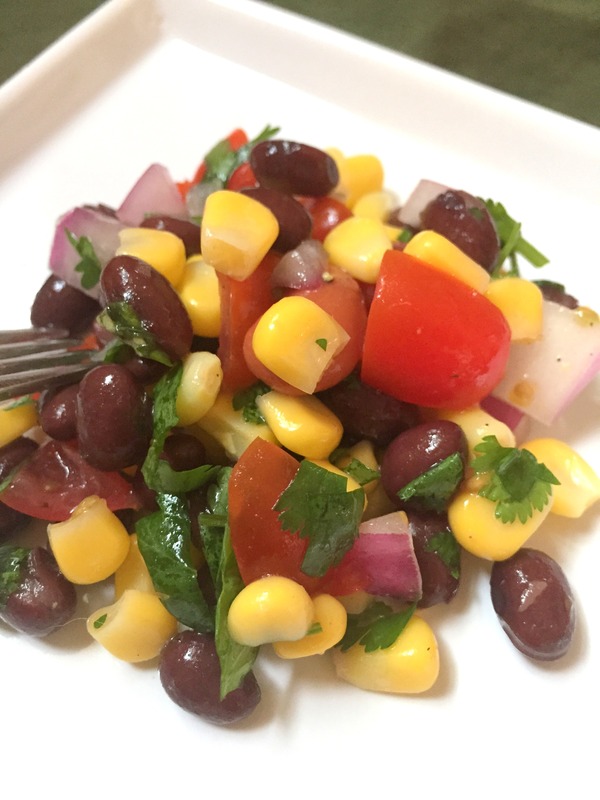 There are about a hundred versions of black bean and corn salads on Pinterest and after looking over a lot of them we came up with this 6 Ingredient Black Bean Salad that is so easy, light, and best of all totally delicious and satisfying. 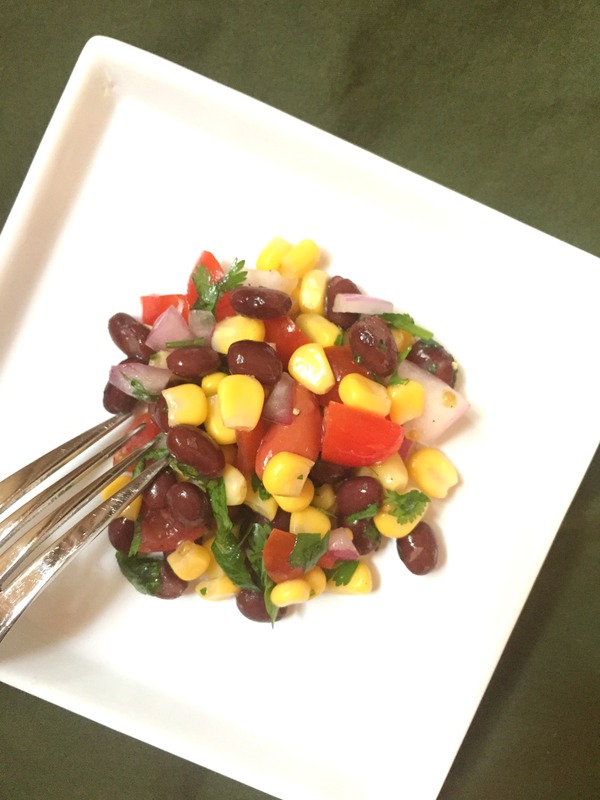 And don’t forget it’s only 6 ingredients (I didn’t count olive oil and s&p because those are kitchen staples, right) so you’ll be surprised at how easy to make this is and I’m sure this recipe will be on repeat in your house all summer long. Once you’re done chopping ingredients, mix everything together. Serve room temp or chilled. Enjoy! 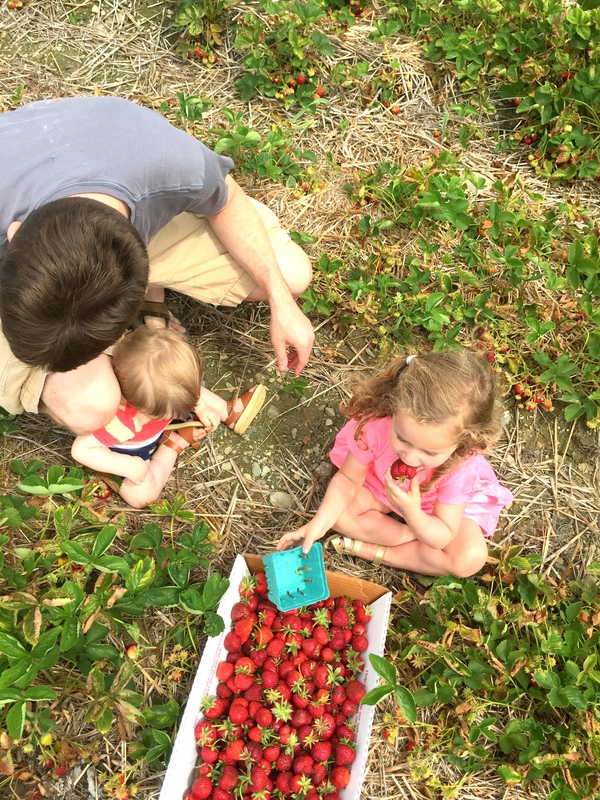 ‘Tis the season for picnicking! 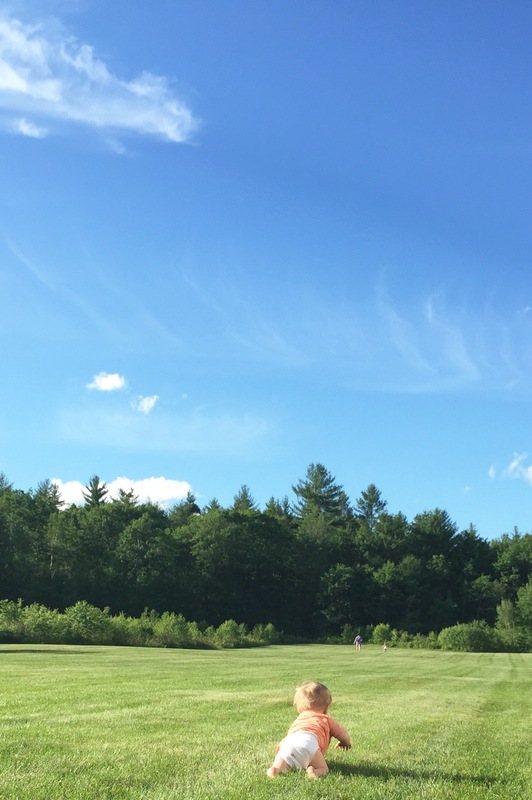 If you’re like us, you will eat a lot of meals outdoors now that the weather is cooperating – from outdoor concerts, to picnic lunches, to playground snacks. 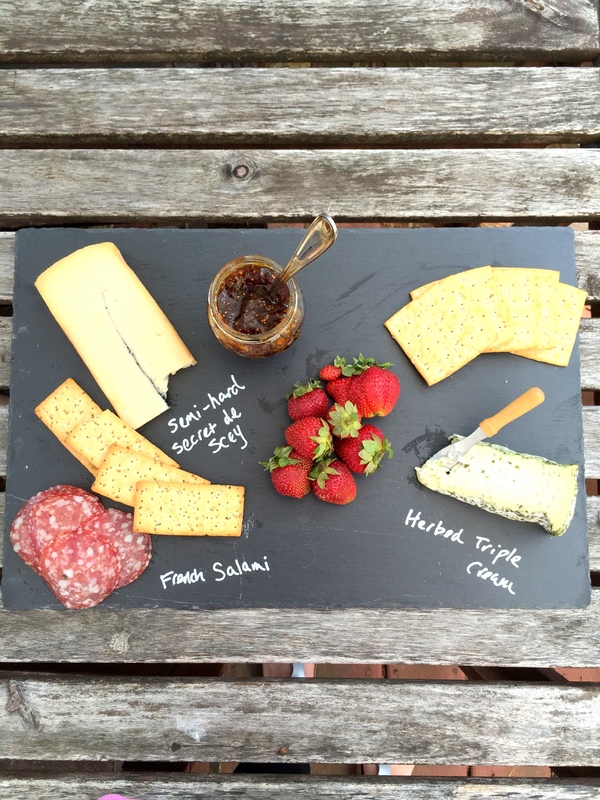 One thing we love for these sort of occasions is a cheese board. And a well constructed cheese board is one of my very favorite things. In my opinion, the perfect cheese board should have at least 2 varieties of cheese (really 3 is best but that depends on how many people are dining), a salty meat, fruit, crackers and/or bread. Some people like olives too but since I’m the only olive-lover in our house I don’t put those on the cheese board. I used to throw some things together on our large Boos Board until a friend of mine gave me a slate cheese board for Christmas and ooooh, how I had always wanted one! If you’ve ever been to a party at our house you know I’m pro labeling appetizers when we put them out so no one is guessing what anything is. 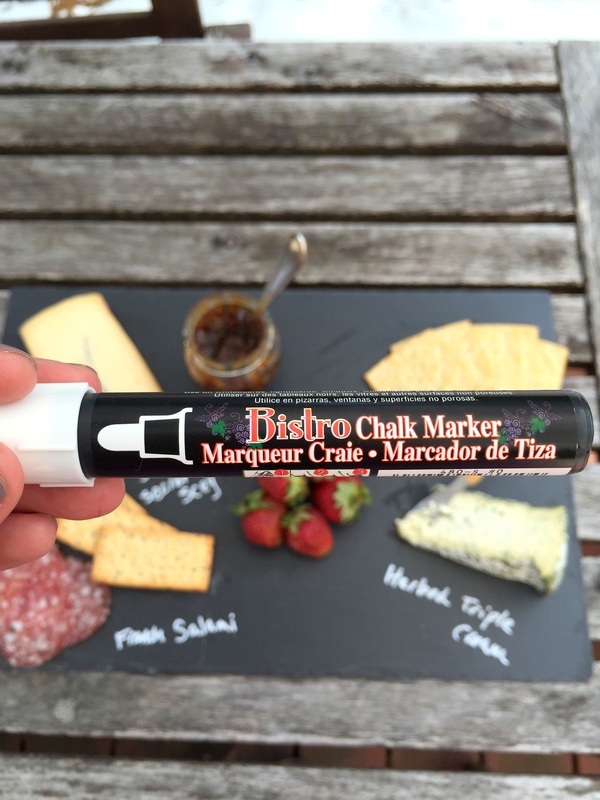 So what is better than to put your cheese right on a board that you can write all over! The cheese board in these photos was for a naptime lunch for my husband and I. We had an herbed soft cheese and a semi-hard cheese with fig jam to top. 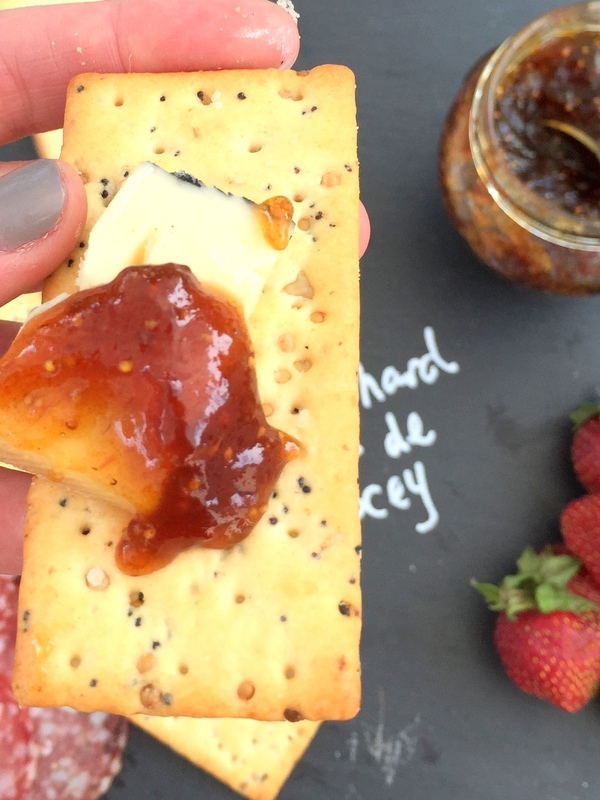 I included a flavorful cracker and a more plain cracker for the herbed cheese. 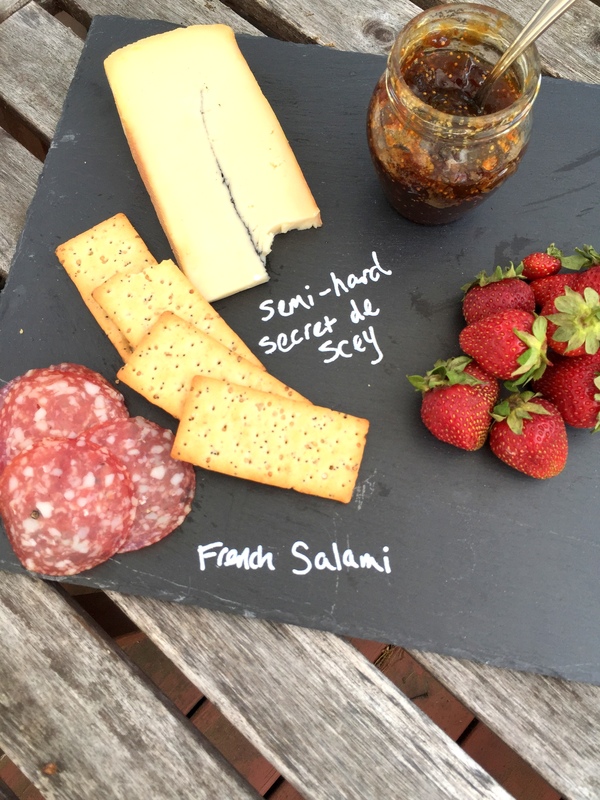 A tiny bit of salty salami and a generous pile of fresh strawberries. By the way, if you get one, your slate board will probably come with chalk to use but I prefer one of these chalk board makers for a sharper look.